After entering the length and width or diameter and submitting, the total cubic yards of mulch are displayed. Site visitors can enter the dimensions of the area they need mulch or soil for and the desired depth (2", 3", 4", etc.) and the total cubic yards required will be calculated. If you sell bark mulch by the bag or in bulk, we can add the corresponding mulch product information and pricing so your customers will know how much it will cost to either purchase mulch by the bags in the store or to have it delivered in bulk. We can determine the amount of mulch required for both rectangular and circular areas. 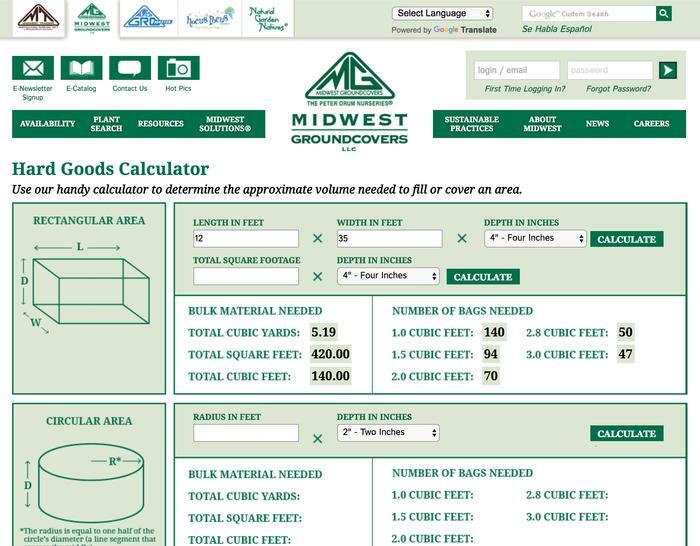 You can check out examples of both the Plant Calculator and Mulch and Soil Calculators here.